Making your own butter is so easy to do. You don’t need any special equipment at all and you only need one ingredient. The whole process from beginning to end takes 15 minutes at most. Price-wise, here is the breakdown. Tesco currently sell 250g of Anchor butter for £1.70, or you could opt for the Tesco Value butter at £1.19. One 600ml pot of double cream makes 300g of butter and costs £1.80, or Tesco often run a 2 for £3 offer making them £1.50 each. That means you get 50 grams more butter for 20 pence less than it costs for a brand name if you purchase the cream on the 2 for £3 offer. At worst you pay ten pence more for the cream but you still get 50g extra butter for your money. Better still, if you shop at the end of the day or find tubs of double cream reduced further to sell before their use-by date you can save plenty more! Pour a tub of double cream into a clean bowl. Make sure it has been left out at room temperature for an hour or two before starting. We’ve used 600mls which makes approximately 300g of butter. Using a hand whisk start whisking! Needless to say, an electric one will make the job much quicker and easier! Keep pressing the butter until it seems you can’t get any more buttermilk out. The buttermilk can now be stored and used in other recipes. It’s great in pancakes or even with cereal! When the water has turned cloudy pour it away and replace with fresh water. It is important to completely squeeze out as much buttermilk as possible as if left in it will turn the butter rancid. Don’t worry about squeezing too hard – you can’t hurt the butter so don’t hold back! Continue rinsing and squeezing the butter until the water no longer clouds. We find this takes around four or five rinses. Pour away the water from the final rinse, which should now be fairly clear. You can now taste the butter. You may want to add a little salt to it which also helps to preserve it for a little while longer. Don’t overdo the salt though as you won’t need much. Add a little and squeeze and mould the butter as if moulding dough. Taste to test, adding a little more salt if required. Remember, it’s easier to add more salt than to take it away so only add a very small amount at a time! Once the butter has been salted to suit (or not, if you prefer your butter unsalted), place in a Kilner jar, a butter dish, or simply wrap in greaseproof paper. 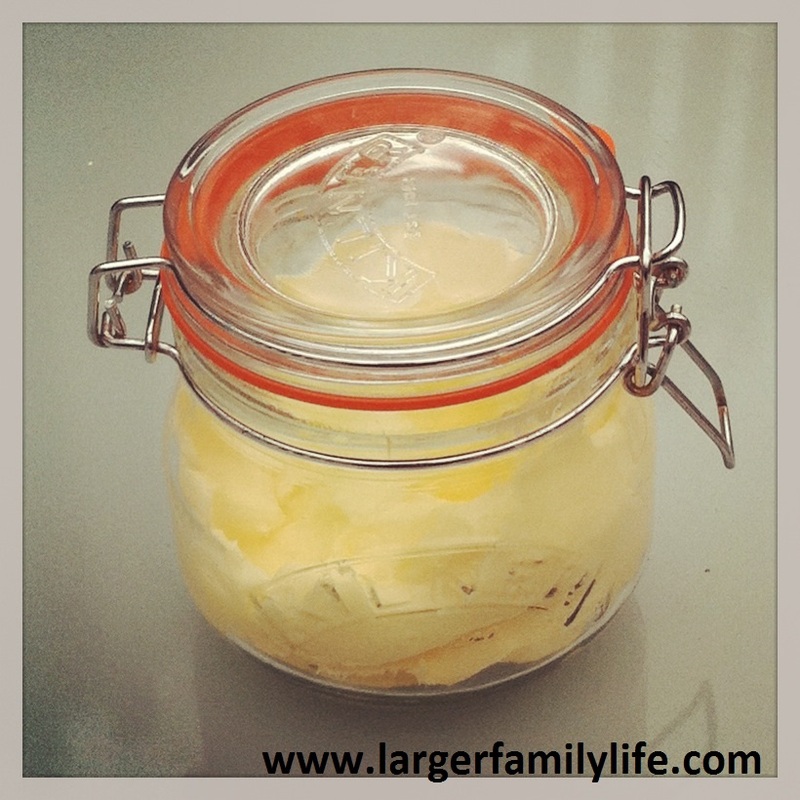 Your butter will keep for a week or two if thoroughly rinsed but ours never lasts beyond a couple of days! So now that we’ve given you a full guide on how to make your very own homemade butter, how about trying it with some delicious homemade jam piled high on lovely, warm, homemade bread fresh from the oven? Gorgeous, fresh, cheap and very yummy!